For making Sugar Syrup: Melt sugar and water in a pan and keep stirring on medium fire till it reaches one thread consistency. Remove from fire and add cardamom powder, food colour and camphor mixed in a little water. Keep the syrup warm. For making the Boondis: Mix gram flour with enough water to make a smooth pancake like batter. Heat oil in a frying pan on medium heat. Pour the batter through a dry perforated ladle or boondi plate and let the boondi fall into the boiling oil by gently spreading the batter with a spoon. Drain the boondis before it gets browned and drop into the warm sugar syrup. Repeat with the rest of the batter. Fry the cashew nuts, raisins and cloves in ghee and spread these with the ghee over the boondi. Mix all the ingredients together pressing the boondis with the back of a spoon to absorb all the sugar syrup. Add Kalkandom/ sugar candy and mix well. 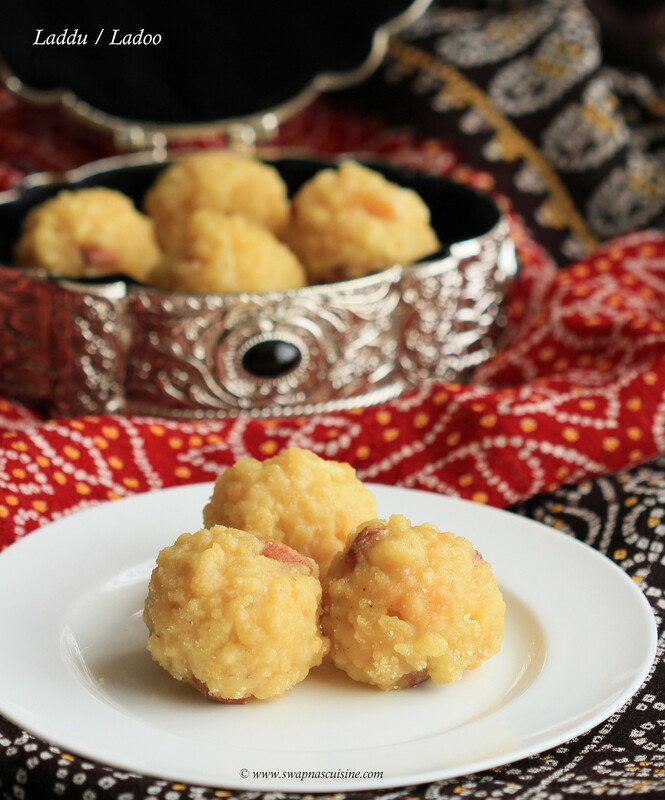 To make ladoos, gently squeeze some of the warm boondi mixture between both palms and shape into Ladoos. 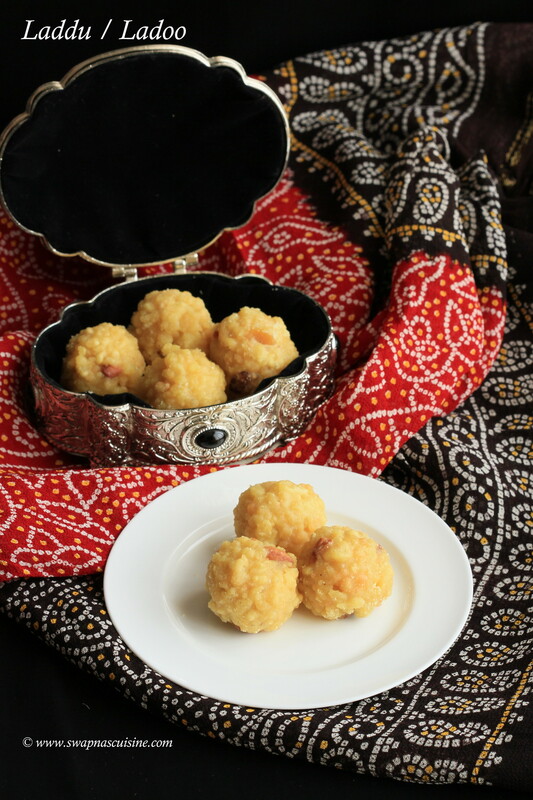 Ladoo will become firm when it cools down to room temperature. Sugar syrup should be one thread consistency. Gram flour batter should neither too thick nor too thin. Wash perforated ladle or boondi plate and wipe it clean and dry before pouring the next batch of batter. Melt the butter and dark chocolate in a large heavy based pan over a low flame. Alternatively, cover the bowl loosely with cling film and put in the microwave for 2 minutes on High. Pre heat oven to 180˚ C. Line the base of a shallow 20cm square tin with non-stick baking parchment paper. Sieve flour and cocoa powder together to get rid of any lumps and keep aside. Break eggs into a large mixing bowl and add in golden caster sugar. Whisk the eggs and sugar on medium speed until they look thick and creamy or the mixture becomes really pale and about double its original volume. Pour the cooled chocolate mixture over the eggy mousse, then gently fold together with a rubber spatula, without knocking out the air. Gently fold in flour-cocoa mix and stir in the white and milk chocolate chunks until they’re just combined. Pour the mixture into the prepared tin and level the top with the spatula. Put in the pre heated oven and bake for 25 to 35 minutes or until the top has a shiny, papery crust and the sides are just beginning to come away from the tin. Take out of the oven. Leave the whole thing in the tin until completely cold. 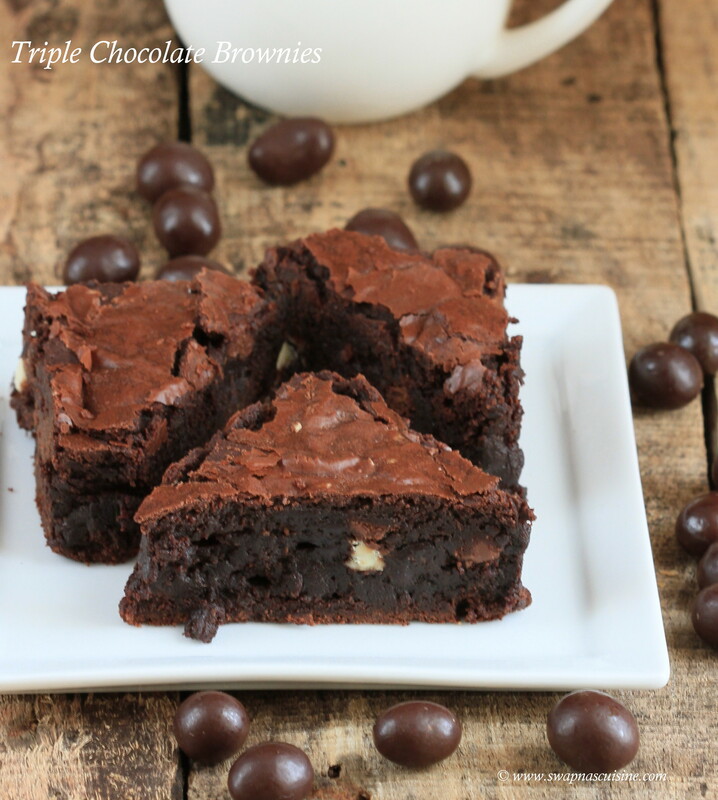 Cut the brownies into triangles. 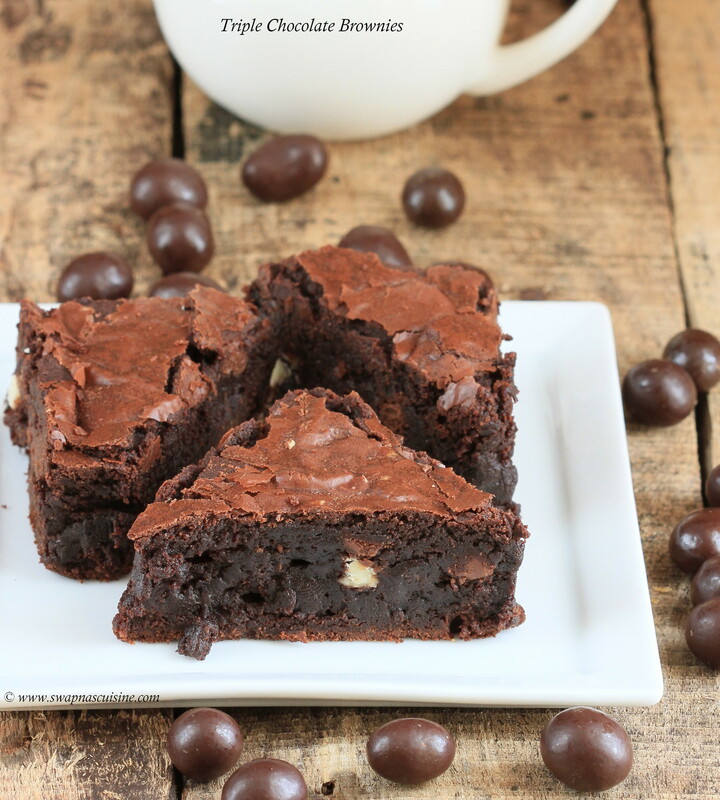 Serve as it is or slightly warm the brownies and serve with a dollop of vanilla or coffee ice cream. It’s been a long time since I have posted a new wine recipe. Today’s wine is with Kerala Ethakka / plantain and it is a sweet wine. I have used one orange and two grapefruits in this recipe. If you cannot find grapefruit, you can substitute it with oranges. 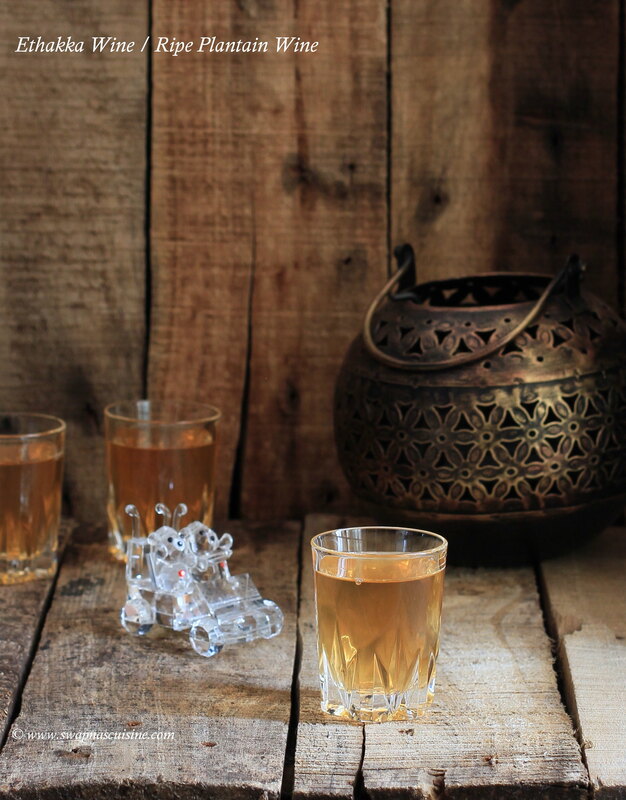 Please make sure to go through my earlier post “Tips on making Kerala Homemade Wine” before you attempt making wine at home, which will help clear lot of doubts and save your time and my time spent on clarifications! Cut Ethakka / Plantain in small pieces. Put ethakka pieces in a large pan and 6 cups water and bring this to the boil and simmer for approximately 15 minutes. Strain and pour the mixture into a clean large pan, while the mixture is hot making sure not to squeeze the ethakka / plantain pieces. Discard the ethakka pieces. Wash orange and grapefruit and wipe it with a kitchen tissue or clean cloth. Take out the zest from one grapefruit and orange with a citrus peeler or vegetable peeler. Add orange & grapefruit zest along with orange and grapefruit segments making sure not to add white pith or seeds, raisins and sugar to the hot boiled ethakka / plantain water. In a small bowl, mix ½ cup lukewarm water, ¾ tsp yeast and ¾ tsp sugar and keep aside for 10 minutes. When the mixture becomes frothy add it to the cooled mixture and mix everything well. Transfer the mixture to a sterilized glass bottle / bharani, cover it and leave for 21 days stirring daily. After 21 days, strain the mixture through a cheese/muslin cloth in to a clean dry bottle. Keep this again for 14 days untouched. After14 days strain the wine again, pour it in to clean dry bottles and use.